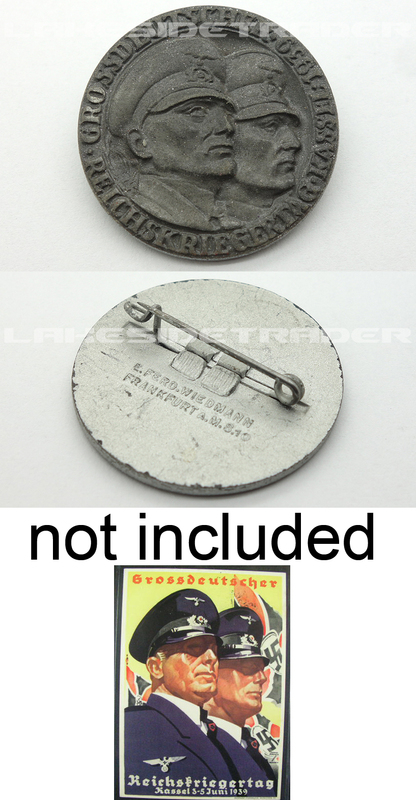 This tinnie was donated for the Veterans Day event in Kassel on June 3-5, 1939 to honor the veterans of the recently reunified Grossdeutschland. It is constructed out of a die struck zinc base that has been silver washed, black burnished and finished in a protective lacquer coating. The round shaped obverse features two NSKOV Veteran Soldiers surrounded by: “Grossdeutscher Reichskriegertag Kassel 1939”. The full back reverse is maker marked “E. Ferd. Wiedmann Frankfurt aM S.10”. It also features a well working horizontally crimped on steel pin. It measures 1 3/8 inches in diameter. The lower postcard is not included it is only to show an example. A nice one!